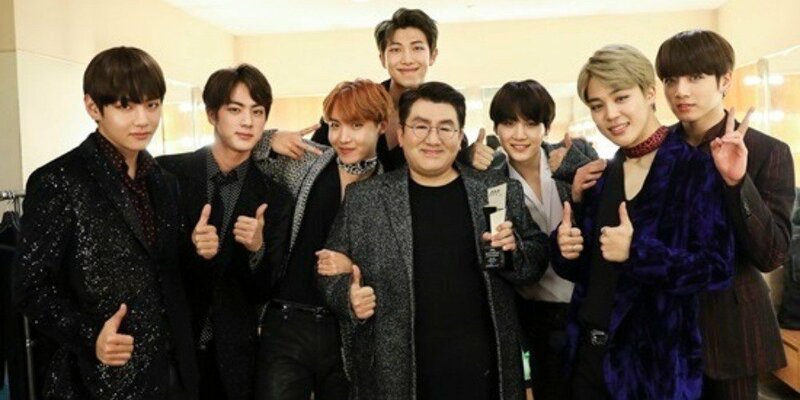 Recently, it's been reported and predicted by a reporter from Hankyung (Korean Economic Daily) that Bang Si Hyuk of Big Hit Entertainment can potentially become the richest person in the Korean entertainment industry if the company decides to go public with an IPO. With the rise of 'The 2nd Hallyu Movement' underway with popular idol groups such as TWICE, BTS, and many more, entertainment-related stocks have been soaring every day, which as a result, has increased major shareholders' values significantly. JYP Entertainment's majority shareholder, J.Y. Park (co-founder and CCO of the company), currently has a stake over 100 billion KRW (approximately $93 million), surpassing Yang Hyun Suk of YG Entertainment. With this in mind, the reporter predicts that if Bang Si Hyuk, the founder of Big Hit Entertainment, goes public with an IPO, he can expect to hold over several hundred billion KRW worth of stocks. Currently, Lee Soo Man, the founder of SM Entertainment is sitting at the very top, the largest shareholder in the entertainment industry stock market. Compared to last year, his value increased from 102.1 billion to 202.9 billion (approximately $189 million) this year. Despite not being in the 'Big 3' companies, Big Hit Entertainment recorded an operating profit of over 32.5 billion KRW ($30 million) last year through the popularity rise of BTS, exceeding the three major companies. With this in mind, the possibility of an IPO has increased. Big Hit Entertainment's potential market capitalization is estimated to be around 700 billion KRW ($651 million) with Bang Si Hyuk holding 50.88% of the company, his stock holdings would be worth 350 billion KRW ($326 million). According to the writer, the financial investment industry is seeing the stock market with a positive outlook and is mainly due to the second rise of the hallyu movement. Various Japanese media reported that between the ages of 10s and 20s, the 'Hallyu Boom' has started again after Girls' Generation and KARA's huge success, with the help from TWICE and BTS. All of TWICE's Japanese single albums topped the Oricon chart and what's more, the girl group became first K-pop group to appear on Japan's historic, famous music show called the K?haku Uta Gassen, since Girls' Generation and TVXQ back in 2011. Meanwhile, BTS have been gaining attention and awards even just beyond Asia, breaking records left and right.